Can anyone explain why his hand turned into a head of cauliflower? Some fish decided he wanted some finger sandwiches. No. It's actually very painful and terrifying, heard that during the Andrea Yates trial. How can you drown and live to tell about it? Piranhas have the reputation for being ferocious little fish who feed on flesh like there’s no tomorrow. While most scientific research supports the notion that piranhas don’t attack humans to kill for food, there have been a handful of cases where it may have been so. In this case, Petrobras excavator operator was working on a gasoline that passes through the Amazon river when whole excavator crashed into the stream. Trapped inside heavy machinery, the operator broke the glass so as to free himself and swim to the surface. As he was forcing his way through, he cut himself on the broken glass and started bleeding. Blood has attracted the school of piranhas who ate the man’s flesh down to the bone. 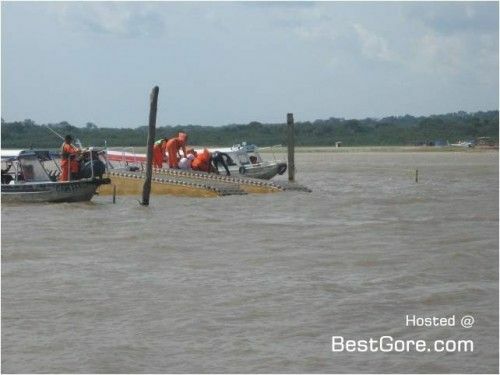 Someone suggested that this whole story of Petrobras excavator operator getting eaten to death by piranhas is a hoax, based on photos. Especially the eye sockets which allegedly should look different without the eye balls. I don’t know whether it’s a hoax or not – snopes has nothing on this and I have no other means to verify. However, compared to other skull pictures widely available on line, I don’t think these eye sockets look much different. What do you think? Real or fake? Could piranhas eat a man down to the bone like this? From one picture it would even seem that there were piranhas inside the man when he was “fished out” of the Amazon river, suggesting that he may have been eaten from within.